Abercrombie & Fitch, the controversial retailer that's known for featuring scantily clad teen models in its advertising, is making a big marketing shift. The company said earlier this month it will offer larger plus sizes for some of its women's clothes online in 2014. The company has been slammed by many consumers and youth advocacy groups ever since CEO Mike Jeffries said in a 2006 interview that its clothes were more for "cool" and "good-looking" people. Several customers applauded the retailer's move to be more inclusive. "It's good to have some change," said Isaiah Castillo, 24, who was shopping at an Abercrombie & Fitch (ANF) store on Fifth Avenue in New York last week. "It will definitely attract more customers. You will have a variety of people." Shopping at the same store, Karen Black, who was visiting New York from the United Kingdom, said she felt frustrated sometimes when she failed to find her size at A&F stores back home. "I think it's a good idea they are doing that," she said. "Half of the clothes are too small for me. It's stupid." Currently, Abercrombie & Fitch does not carry sizes above a 10 for women's clothes. Michael Scheiner, the company's director of marketing and public relations, would not to go into details about exactly what size options the company will be offering and when the new sizes will be available. He also would not say if the plus sizes will ever be offered in the stores themselves. "We continue monitoring customers' demands and preferences," said Scheiner. "We will make decisions based on that." But it's clear that Abercrombie & Fitch needs to do a better job of catering to once loyal customers and also find some new ones. Sales, earnings and profit margins have been sinking lately. The stock is down more than 25% this year. 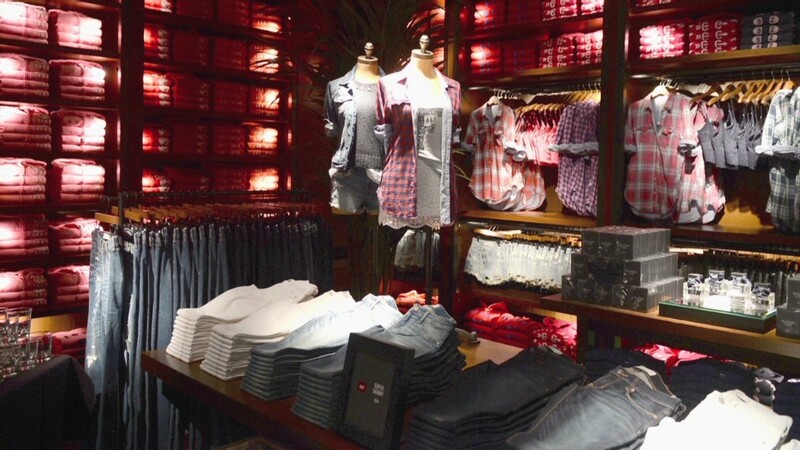 Abercrombie & Fitch will release its latest quarterly results on Thursday morning. The retailer has already warned that those numbers are not likely to be good. "It is clear that we have to win back and reengage lapsed customers, particularly on the female side of the business," said Jonathan Ramsden, the company's chief financial officer, in an analyst meeting earlier this month. Jeffries apologized for his 2006 comments in May of this year after the original interview on Salon resurfaced and made waves. But some consumers were still angry. "Dear Abercrombie and Fitch, my children will never wear clothes from your store," wrote Jennifer Lauer on Abercrombie & Fitch's Facebook page earlier this year. "Not because I will forbid them to, but because I will teach them that morals are more important than clothes." Still, could the move to offer plus sizes backfire? Russell Winer, a marketing professor at New York University, expressed concerns that offering larger sizes may alienate some current customers. He said some "may stop shopping at Abercrombie and go to some other competitors." Winer conceded it is likely that the retailer's new strategy will bring in more revenues in the short run. But in the long run, whether or not the company will stage a comeback remains to be seen. "It all comes down to what is the value of Abercrombie and what is the meaning of the brand," Winer said. "The brand equity in Abercrombie has always been around style and young, edgy people." But Castillo, one of the shoppers at Abercrombie, didn't see how the retailer could lose by making its clothes available for more people. "No matter you are big or thin, everybody should be able to wear whatever they want," he said.